The Snuffle Mat is a foraging feeder for dogs and is an excellent way to provide daily mental stimulation at meal times or to occupy your dog when you’re busy. Sprinkle dry food on to the mat and ruffle the strips to shake it in. (Dehydrated meat works well for raw feeders.) Your dog uses their nose to search through the strips and find the food. Easy environmental enrichment! Stimulate your dog’s brain, give an outlet for scent drive and encourage natural foraging. Increasing mental stimulation can reduce problem behaviours! While geared toward dogs, Snuffle Mats are also great for cats, rabbits, guinea pigs, birds & other small animals. Each Snuffle Mat has a rubber base, with fleece strips woven through the holes and carefully hand tied. Mungo’s Snuffle Mats are available in three levels of difficulty. Level 1 is our beginner mat with shorter fleece strips to search through. Levels 2 and 3 have increasingly longer strips which mean a greater challenge for the dog. Smaller To Go Snuffle Mats are ideal for smaller pets and for travelling with dogs. 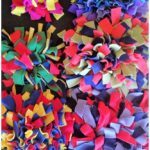 Mungo’s Snuffle Mats are made by a professional dog trainer near Calgary, Alberta, and are available through Mungo’s Books for Dog People. Mungo’s Books was founded in 2006 and has been making toys since 2014. Dry food is sprinkled on to the fleece strips and shaken in to hide it. The dog must use their nose to search through the strips for the hidden food. Works well for beginner dogs and toy breeds, cats and other small animals. The fleece strips are a short enough length to stand upright, setting the pet up for success in finding food. Level 2 mats have longer fleece strips for a greater challenge. The strips are long enough to flop over, creating a more difficult search and scent is more of a factor in finding the food. Level 3 mats have even longer fleece strips to increase the challenge again. The strips flop over and require more effort to push them aside to seek the food. To Go mats are a handy smaller size – great for small pets and ideal for travelling with dogs, road-side, in a hotel, at a sport venue. Approximately 6”x6” rubber base with fleece strips woven and tied through theholes. To Go Level 2 mats have longer fleece strips for a greater challenge. Supervise during use and remove when thedog is done. These mats are NOT for chewing. Always examine mat for wear and remove any damaged strips. If the dog is destructive, use common sense. Some dogs need a bit of training to use the mat as intended.Gently interrupt attempts to pick up the mat or pull at the strips and redirect the dog to seeking food. Most dogs are so busy using their noses to find the food that they do not resort to destructive habits. Hand wash or machine wash fleece and lay out to dry. Rubber base is flammable, so the mat must be kept away from heat sources. Playing tug is a fun relationship builder and can be used as a high-energy reward in training. In fact, many agility trainers use tug toys to reward their dogs. Tug play a great way to teach self-control and a solid “drop it” cue – all while just having fun with your dog! Some dogs even like to play tug with each other. Mungo’s Tug Toys are carefully hand-braided, using fleece in bright colour combinations and are approximately 45” long.The braids are uniform and the ends neatly trimmed for a high-quality finish. Intended for interactive play. Supervise during use and remove when finished play. Tugs are NOT for chewing. Always examine tug for wear and remove damaged toys. If dog is destructive, use common sense. Tug toys can be machine washed and dried.